Cupcakes 'n Daisies: It's Tuesday . . .
and you know what that means, it's Eventide Update Day! But first, I got a note from a fellow quilter who attended the Red and White quilt show yesterday! She said it was amazing and gave her goosebumps! I got goosebumps just reading about her goosebumps! More importantly, there IS going to be a show book available, however it won't be published until next year. There's been some confusion over this, what great news, count me in! Wow, can you believe it has been around 8 weeks since I came up with this little idea to see if anyone out there in Blogland wanted to sew along with me while I worked on Eventide? I am still amazed and humbled by the response I received. I was looking for one Eventide sew along buddy and I got dozens. I live a small life in a small town. I am the only member of my family, extended or otherwise, who quilts. If I wanted to participate in some of the sewing activities held in local quilt shops, I would need to drive at least an hour, one way. Through my blog I have been exposed to so many wonderful and giving bloggers, folks who freely share their expertise, tips, and humor. I am no longer a lonely quilter. I appreciate every friendship I have made. 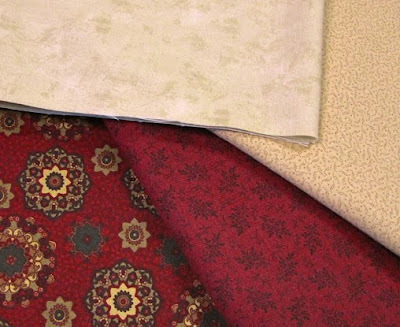 I selected Eventide for a sew along because I saw the quilt that was used for the pattern cover while attending a Carrie Nelson class, I thought it was lovely, and thought if some other folks thought so too, we might as well have some fun and sew along together. I am so glad I invited others to join me. Imagine my amazement when not only did folks sign up to sew along, but that fellow quilters as far away as the Netherlands and France joined in, it has turned into a real international affair. I've also enjoyed giving quilters without blogs the opportunity to "talk" and share their Eventide adventures through my blog. I am not an employee of Carrie Nelson or Miss Rosie's Quilt Company. Quilting is my hobby, my passion, not my job. I'm just a simple quilter who wanted to make a quilt and who went looking for a few sew along friends and struck the jackpot. I think this has been one of the most fulfilling events I've undertaken as a blogger and quilter. And when it's all said and done, quilters all over this world will have a beautiful Eventide quilt and hopefully fond memories of making that quilt with others. I could not ask for more. Now, for the updates. . . . I promised Anita I would show her progress on today's update post first. Her picture got lost in my in-basket, and after a couple of weeks of no update on my Eventide Update posts, she sent me a very nice note. Anita is using Rural Jardin by French General for Moda and I think it's going to be stunning. Thanks for your patience Anita, I'm thrilled you've joined the sew along and look forward to seeing your finished project! Gayle followed Carrie's lead and went with two reds for her inner border. I love it, but then they are red! here's a sneak peek of her Eventide. I heard from Leona, she's still working on her Eventide, but no pictures, yet. here's another sneak peek to hold you over until next week's parade! Marianne is continuing to work on her Eventide using Garden Party by Blackbird Designs and made a lot of progress in one week. Marianne says, "At first I wasn't gong to participate in the sew along, but after seeing all the other projects as they progressed I decided to join in the fun. I've never made a bed size quilt in less than a month's time, but I'm going to spend every spare minute I have to try and finish this quilt in time for the parade". Marianne, your Eventide is a stunner, I hope to see your Eventide finished and in the parade! 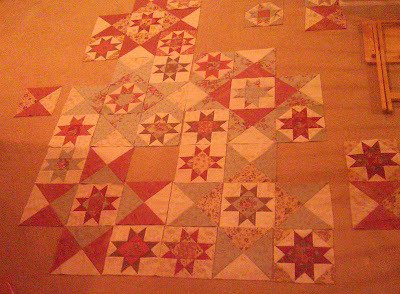 These are the Ohio Star blocks that did not make it into my finished Eventide. I really liked the block with the blue points, but I thought it was a distraction, my eyes were continually drawn to it, but that may have just been me. When it was in my quilt, someone left a comment saying it looked like a little blue wink in my quilt, which I thought was a cute description, but I still pulled it! The stripes in the bottom row center block just didn't fit in with the rest of the fabrics that I used. The other blocks were either too muted or too bold, I just didn't think they fit in. I liked them when I made them but it wasn't until I had all the blocks on my design wall that I realized they were not good fits. We have a new addition to our sew along group, Melissa couldn't sit on the sidelines any longer, especially when an Eventide Pattern jumped in her shopping basket all on its own! Melissa has chosen Rural Jardin by French General for Moda. Even though Melissa got a late start, her design wall is filling up with blocks. Bea's finished her Eventide and blogged about it today. She went with one outer border fabric instead of the scrappy rectangles called for in the pattern and I like how it really frames her work. Great Job Bea! Carol's done, congratulations Carol! No pictures yet, look for her Eventide in the parade. Gretchen's Eventide is done, check it out! Congratulations and thanks for the sneak peek Gretchen, I look forward to seeing it all next week. I agree, Fig Tree and Eventide are a great match. Lisa promised to have an Eventide update today too, I've not seen her progress but she's using Luna Notte, how could it not be wonderful. Mary Lou continues to make progress on her Eventide along with a host of other lovely finishes. She's thinking about maybe making some changes but I think it looks great already. All Nicole has left for her Eventide finish are the borders! Paula's finished her Eventide and has several very touching posts of how working on this project brought her comfort as she dealt with the loss of her sister. Paula, I'm so sorry for your loss, your project is lovely and could not have a more perfect name. Sharrie's still auditioning fabric for her Eventide, personally, I think once you're happy with your fabric choices, this project is a breeze. Hang in there Sharrie, you'll get it to your liking! Sinta "got crackin" on her Fig Tree Eventide and has new pictures of her progress. I think that's it for the updates, be sure to drop me an email if I missed yours! I want to make sure no one gets left out! And now for a few winners . . . Jen - Miss Punkie Pie . . .
you're last week's comment winner. Send me your address so I can send you this lovely little bundle of Charlevoix by Minick and Simpson for Moda. send me your address and these two charm packs of Maison de Garance along Carrie Nelson's latest and greatest Schnibbles patterns (yes, all 6 of them) will be heading your way in this cute little Schibbles project bag. just leave a comment on this post by midnight, CST, Wednesday, March 30, 2011 to be eligible to win. Krystena, Gayle will send you her extra Eventide pattern but I don't have a way to contact you, could you please send me an email with your address? Whew, I'm all talked out...thanks for stopping by! Darn it, I'm too late! Had I found this sewalong earlier, I'd have jumped in like a shot. Story of my life that. I have really enjoyed following everyones progress Thelma! I now have my pattern, but sadly it will have to wait awhile. I can't wait to see the parade!! Oh my gosh, I can't wait til next week to see all the quilts! I wish I could have jumped on the wagon for this one but just not enough time..maybe the next one! There will be a next one right Thelma??lol! It is wonderful that so many joined you in making Eventide. It has been fun watching everyones progress. Can't wait to see the parade of quilts! Really looking forward to the parade. They all look so great so far. Like you I live in a very small rural village and appreciate friendship made through blogland. Are you making another sewalong in the future ? Can't wait to see the next week parade. Wow! Great progress on all these quilts. I am so darn impressed at everyone's work! Next week will be a big treat!! Thanks so much for making this happen, Thelma! I'm going to get a better picture for the parade, but this IS a rather large quilt! I love it, particularly how the large stars quietly create complexity! Thanks Carrie, for a great pattern! Today I'm ruminating on what to start next... I assure you I have quite a few projects in my quilting cabinets just waiting to be created! One that I really want to make is "Quiet Time," also by Carrie. It will have to wait a bit, however~ I'm feeling the need for a break from quarter square triangles, LOL! I'm still plodding along but hope to have most of the top done for next week. Not sure that it will be finished...life is busy with college visits. I am loving it though. Whata pretty quilt. Thank you for taking the time to do this Eventide Sew Along. Even though I didn't participate in the sewing, it has been fun to see everyone's progress. I hope you do this again! So glad to be part of this group! WOW!! I won?! How exciting!!! Thank you!! An email with my address coming your way. Beautiful work!! Looking forward to seeing the finished creations!! Thanks for being a gracious hostess, Thelma! It is very much appreciated. I wanted to update my pics last night but hubby was asleep in front of the computer and I didn't have "access"! ha! So there's a couple of new pics today but NOT much progress. Oh well! I still have a WHOLE week. It's been great following along. I can't wait to see the final parade. What fun this is Thelma! 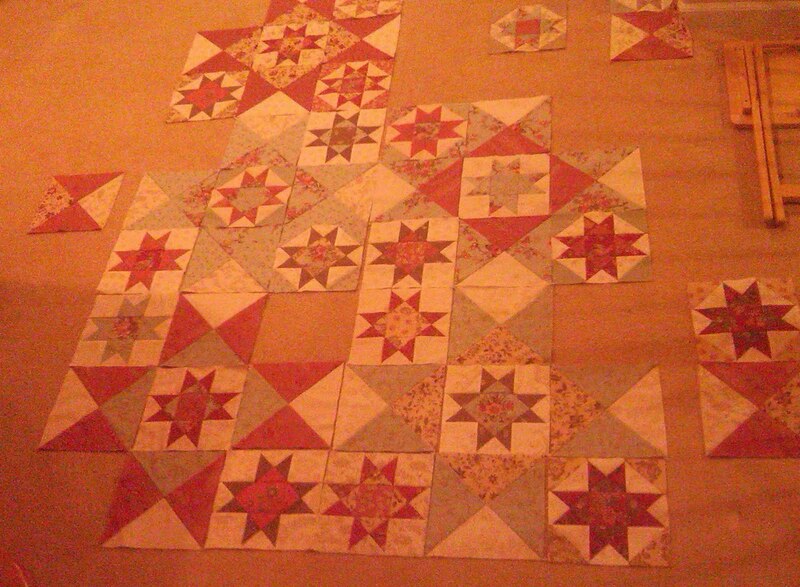 Even though I'm not sewing along, I am enjoying following the progress of the quilters. Can't wait for the parade! This is so fun to follow everyone's progress. I'd love to win the Schnibbles bag. Thank you for the opportunity to win. I didn't participate in this one, but *YAY* for you on the success of your Eventide Sew-Along! I've enjoyed seeing all the different versions and have found some great new-to-me blogs too. I love seeing how everyone interprets this pattern - it helps me think outside the box for my quilts! I sure would love to win that Schinbbles bag - thanks!! Hugs! I've really enjoyed checking out all the pics and blogs with this quilt-a-long. Thanks! Thanks for the Eventide updates. It's fun to watch everyone's progress. Did you see Carrie's blog post that photos of the Red and White quilt show was available for the iPad? Free? I downloaded it and I don't even *HAVE* an iPad! Really enjoyed watching the progress on these quilts. All of them are beautiful. Looking forward to the reveal! I wish now I had joined in the making of Eventide but no way can I get it done in a week!! Add it to the list of things I need to make!! I would love to win this Schnibbles Bag o' Goodies! Thanks Thelma for hosting this sewalong and blogging for me! Even showing my ugly pic :( I loved your post and I am also the only quilter/crafter in my family (including extended). When my cousin saw all the sewing and crafting I did he said "You need to go to a club", as in nightclub. That said, I love connecting through blogging and am so grateful you hosted this and included me. Thanks! Can't wait for next week's parade! I'd love to win the schnibbles goody, as I have no schnibbles at all. I would love a chance to win the Schnibbles goodies. And I love seeing all the progress on the Eventide quilts. I wish I could have joined you, but they have given me a lot of inspiration for when I do. Way too much fun following along with this sew project. Way beyond my time constraints but would love to think about a sew-along in the future. Thank you for the chance to win the Schnibbles package. Wow, what a fantastic job you did keeping everyone motivated and on track. I didn't participate, but love reading your blog, you sound like such a dear. Of course, I'd like to win the the Schnibbles kit - those are such fun patterns to make. I'm looking forward to the big reveal. For some reason, I mistakenly thought it was this week. I've finally got my pattern and think I want to do mine in Maison de Garance. Now I just need to buy the fabric! Oh, and I also want to make mine a king-size, so I need lots of it. Oh they are all so unique! I told you I'd be kicking myself for not joining, and now I am! lol I'm going to have to keep my eye out for this pattern. Thanks for the great show! Thanks for hosting the sewalong Thelma - even though I wasn't able to participate I've so enjoyed watching all of these quilts grow and come together! Really enjoying the progress I Eventide! Thelma, I wish you had a quilt group in your neighborhood; but I'm glad you've connected with the quilters through the internet. You certainly have inspired many of us! Thelma, I want to thank you for being such an inspiration to me. I have always sewn but the past two months I have just been taken over by an overwhelming desire to quilt. I can't wait to see the Eventide parade of beautiful quilts. Thank you too for a chance to win the Schnibbles bag o'goodies. I love checking your blog to see the updates on Miss Rosie's Eventide. I wanna make one now and I love maison de garance - it's so warm and cozy. Thanks so much for sharing in the artistry of quilting! There are several blogs I love to check out semi weekly. You really create some beauties. 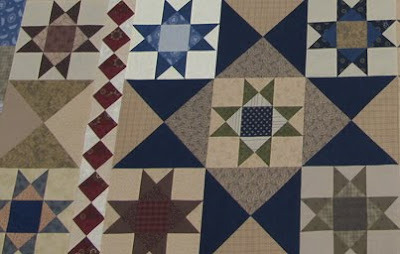 I still want to make the Elizabeth quilt from the Miss Rosie co. I have several schnibbles and some other larger patterns as well. I love making them. Thaks for your give away! I love sew alongs and would have loved participating but my rotator cuff surgery earlier this month put a stop to sewing for a while which greatly distresses me. I have LOVED watching the progress of everyone and it helps my distress in not being able to sew. More excuses, but I will make an Eventide quilt soon. I don't think I can make it this week though. I have really enjoyed watching the progress of all these Eventide quilts. I am looking forward to the grand parade next week. Thank you for sharing your story today. Thank you so much Thelma for hostess-ing this quilt along. I have enjoyed it so much and am so glad it has brought all these wonderful quilters together. This has been a great inspiring project and am so glad it brought you lots of fun too. Can't wait to see all the great projects next week! Even though I am not participating in the Eventide sew along, I have enjoyed following along. I am a Carrie Nelson fan and Eventide is on my list of "somedays." I have so enjoyed the enthusiasm, responses nd pics and hope you plan another sew along... I think you have a BIG SUCCESS here with this concept... Thanks for all your hard work keeping us all in the loop. I'd love to have the chance to win the Schnibbles bag - thanks for your generosity! What a delight to see all the Eventides and the fabric combos are awesome. I am enjoying watching everyone's progress on Eventide. I would love to win the bag of Miss Rosie's goodies. your quilt is coming along beautifully!!! Continue to enjoy watching the progress on Eventide, and am really looking forward to the final "reveal" parade next week. Am also dreaming of the day I might create my own Eventide. Thanks, Thelma, for dreaming up and hosting this sew-along. - Debbie R.